I wanted to play around with Arduino for a long time, and the Arduboy handheld was the perfect excuse to get started! 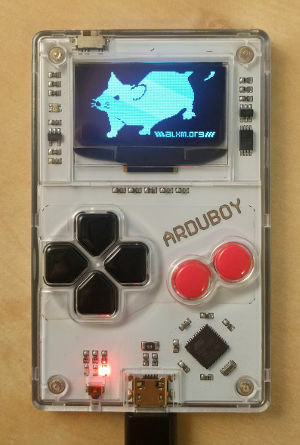 My Hello World program is ArduboyMouse, a sketch that lets you use the Arduboy as a 2-button mouse. Check out the excellent Quick Start Guide on the community forums, it covers everything. I tried the Arduino IDE from the Ubuntu 16.04 repo, but it's too old (1.0.5) and it doesn't support the library fetching functionality mentioned in the Quick Start guide. The avr-gcc and avr-dude tools in the repo are about as recent as those bundled with Arduino 1.8.1 though, which is great since in the future I'd like to build Arduboy games without the IDE. On Linux, Arduboy shows up as a serial device under /dev/ttyACM0. However, only root and the dialout group have access permissions on it, so trying to upload a sketch with the IDE will fail. According to the Debian Wiki, the dialout system group is for full and direct access to serial ports, exactly what we need. You can confirm the change by running the groups command after logging out and logging back in again. While researching this issue, I found an article that suggested changing the permissions on /dev/ttyACM0 instead, to allow rw by everyone. That does not work for the Arduboy though, because the serial device is re-enumerated when the board is reset and put in flash mode, which loses the permission changes you made on the file. The ATmega32U4 microcontroller that runs programs also handles the USB connection, so when the MCU is reset the USB connection is reset too. Read Differences from the Arduino Uno for more details. This is very easy thanks to the Arduino HID Mouse and Keyboard libraries available on ATmega32U4 boards like the Arduboy, which present themselves as USB HID devices. 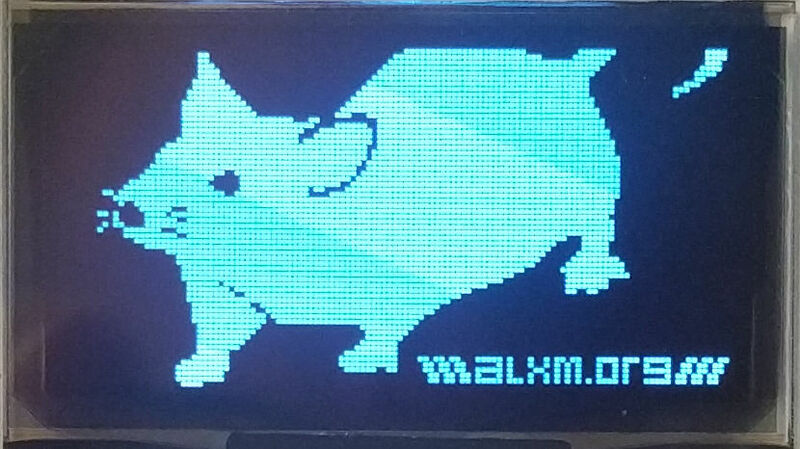 The Arduboy's framebuffer has an interesting format fitting a 1bpp screen, where each byte encodes a vertical strip of 8 pixels. Strips then flow horizontally left to right, and wrap to the next row of 8-pixel strips. Here is a sprite, with the pixel strips highlighted, and finally the bytes as they are in memory. Here byte0..2=0x0, byte3=0x80, byte4=0x70, byte5=0x08, byte6=0xC6, etc. Next up is building projects directly with Makefiles and avr-gcc, and making a few small games. Fun times ahead!